Oscar Stagnaro, originally from Peru, is considered one of the most versatile bass players on the East Coast. His mastery of playing a variety of styles ranging from jazz and fusion to Latin jazz, Brazilian jazz, and South American music has helped him travel the world performing with the very best Latin jazz artists. Says Bass Player magazine, "Oscar’s technical agility, advanced harmonic and melodic knowledge, and grounding in funk and R&B – as well as his dedication to Latin traditions – give him the ultimate flexibility when it comes time to lay down a groove." In addition to his performing career he has developed Latin Bass curricula at both the Berklee College of Music, where he is an associate professor, and at the New England Conservatory. Oscar joined Paquito’s group in 1990. Drummer/composer/educator Mark Walker began his tenure with Paquito D’Rivera in 1989, when Paquito needed a drummer who could handle a variety of rhythmic styles with an authentic feel. Since then Mark has toured extensively around the globe and recorded many Grammy award-winning albums with Paquito, Oregon, Caribbean Jazz Project, Michel Camilo, Lyle Mays, Cesar Camargo Mariano, New York Voices, Andy Narell, Eliane Elias, and many more. In 2018, he will be releasing a solo album of his original compositions with The Rhythm of the Americas Project, a nine-piece group. His composition “Deep Six” was nominated for a Grammy Award in 2008 and his composition “What About That!” was featuring on the Grammy award-winning Paquito D’Rivera Quintet CD Funk Tango. Mark is a professor of percussion at Berklee College of Music and has performed clinics and workshops in Europe, Asia, and the Western hemisphere. His instructional book and CD, World Jazz Drumming (Hal Leonard), features Paquito on an original track. 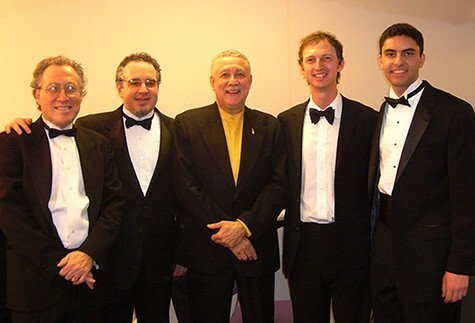 Brown has been a member of Paquito D’Rivera’s ensemble since 2007, performing on and contributing arrangements to their Latin Grammy award-winning album Jazz Meets the Classics. He also performed on and was the principal arranger for their recently released album Paquito and Manzanero. 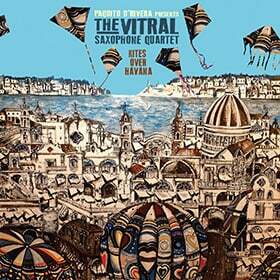 Brown collaborates frequently with vibraphonist Warren Wolf, steel pan virtuoso Victor Provost and the classical wind quintet Imani Winds. In 2016, he performed Gershwin’s “Rhapsody in Blue” as a soloist with the Orquesta Symphonica de Mineria led by conductor Carlos Miguel Prieto in Mexico City. Brown has performed in many of the world’s greatest venues including Jazz at Lincoln Center in New York City, the Kennedy Center in Washington, DC, and the Palacio de Bellas Artes in Mexico City. As an arranger and orchestrator, he has had music performed by premier groups that include the Philadelphia Orchestra. Brown earned his bachelor of music degree from New England Conservatory of Music. He is currently pursuing a Masters degree in composition at the University of Miami’s Frost School of Music. Brown is a YAMAHA artist and resides in New York City.